Suzuki GW250 Forum > Suzuki GW250 Ownership Lounge Area > What Did You Do To Your Suzuki GW250 Today? > What did you do to your Suzuki GW250 / Inazuma 250 today? Share what you did today with the Suzuki GW250 and Inazuma 250 community! Example: Met up with the GW250 group and went on a ride with the boys! Example: Finally received my yoshimura exhaust in the mail. I will be installing them tomorow, stay tuned for pictures. Example: Adjusted the chain and cleaned the whole bike. Oil change and cleaned the chain today. Did a quick wash too!. Here is a picture with all my gear strapped on. That looks really shiny ! Did you put any wax on it ? Oh nice, can't wait to see updates Anything else on the plan list ? Changed oil and reused the Suzuki filter. Now don't bash me for reusing the filter. Next thing is going to be valve check sometime this winter. Did you get around to doing the valves... If not then please take pictures or better still do a little video for people like me that want to do the same but have not got a clue about the process. 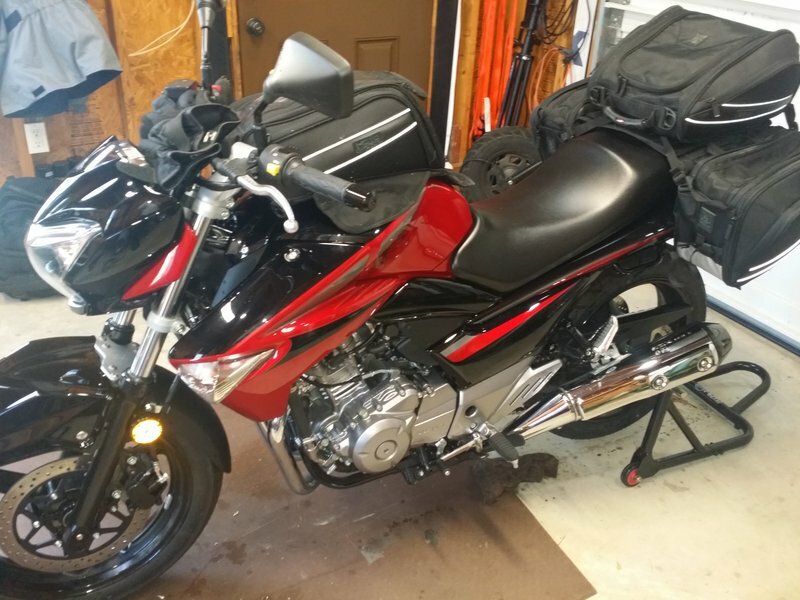 https://www.facebook.com/photo.php?f...type=3&theaterMoved it over so my new bike has room to park.